BIG SALE!! SPUN GLASS SCULPTURES BIG SALE!! 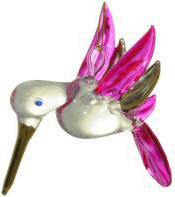 Beautiful spun glass Pink Hummingbird Suncatcher with crystal eyes and gold accented beak, wings and tail. Use as a hanging ornament or place on an ornament holder. These hand made glass hummingbird ornaments with gold string hanger are the last of stock and are very appreciated party and wedding favors. 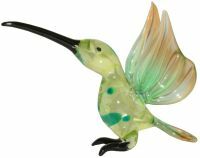 Beautiful spun glass Aqua Hummingbird Suncatcher with crystal eyes and gold accented beak, wings and tail. Use as a window or auto hanging ornament or hang on a prism holder. These hand made glass hummingbird ornaments with gold string hanger are the last of stock and are very appreciated anniversary and wedding favors. 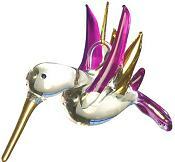 Beautiful spun glass Amethyst Hummingbird Suncatcher with crystal eyes and gold accented beak, wings and tail. Use as a window or auto hanging ornament or hang on a prism holder. Hand made glass hummingbird ornaments with gold string hanger are very popular memorial favors for their uplifting cheerfulness. Classic wood ornament stand with oval Fruitwood base and polished brass hanging wire. Show off your treasures in style. Also available with silver tone wire by request. Scallop Sun Face Prism shown is sold separately. Rare 4" W standing Amethyst Rainbow hued spun glass Sword-Billed Hummingbird figurines. These unique Sword-Billed Hummingbird glass figurines are hand made and beautifully crafted in 6 delicate pastel colors that are stunning in the sunlight. Beautiful 4" W standing Blue Rainbow hued spun glass Sword-Billed Hummingbird figurines. These unique Sword-Billed Hummingbird glass figurines are hand made and beautifully crafted in 6 delicate pastel colors that are stunning in the sunlight. Beautiful 4" W standing Green Rainbow hued spun glass Sword-Billed Hummingbird figurines. These unique Sword-Billed Hummingbird glass figurines are hand made and beautifully crafted in 6 delicate pastel colors that are stunning in the sunlight. Beautiful 4" W standing Orange Rainbow hued spun glass Sword-Billed Hummingbird figurines. These unique Sword-Billed Hummingbird glass figurines are hand made and beautifully crafted in 6 delicate pastel colors that are stunning in the sunlight. Beautiful 4" W standing Pink Rainbow hued spun glass Sword-Billed Hummingbird figurines. These unique Sword-Billed Hummingbird glass figurines are hand made and beautifully crafted in 6 delicate pastel colors that are stunning in the sunlight. 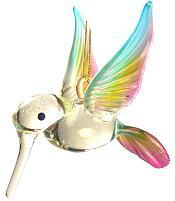 Beautiful 4" W standing Gold Rainbow hued spun glass Sword-Billed Hummingbird figurines. These unique Sword-Billed Hummingbird glass figurines are hand made and beautifully crafted in 6 delicate pastel colors that are stunning in the sunlight. This 3 1/2" round, portable 4 color LED light stand offers a simple yet classic LED pedestal for your small sculptures, art pieces or paperweights! It has a shiny Black Base with a flat mirror top with 4 extra bright LED lights in red, blue, green and yellow that change randomly with a transition of four twinkling lights alternating to three, two and one color light and so on. There is an on-off switch on the side. Use 3 AA batteries for days of continuous use. Batteries are not included. 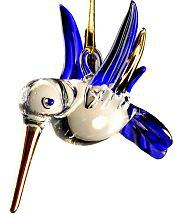 Beautiful spun glass Cobalt Hummingbird Suncatcher with crystal eyes and gold accented beak, wings and tail. Use as a window or auto hanging ornament or hang on a prism holder. Hand made glass hummingbird ornaments with gold string hanger are very popular memorial favors for their uplifting cheerfulness. 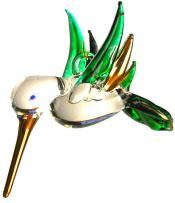 Beautiful spun glass Emerald Hummingbird Suncatcher with crystal eyes and gold accented beak, wings and tail. Use as a window or auto hanging ornament or hang on a prism holder. These hand made glass hummingbird ornaments with gold string hanger are the last of stock and are very appreciated party and wedding favors. 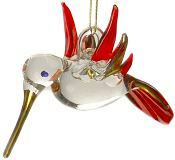 Beautiful spun glass Ruby Hummingbird Suncatcher with crystal eyes and gold accented beak, wings and tail. Use as a window or auto hanging ornament or hang on a prism holder. Hand made glass hummingbird ornament with gold string hanger. Beautiful spun glass Aqua Rainbow hued Hummingbird Suncatcher with crystal eyes. Use as a window or auto hanging ornament or hang on a prism holder. 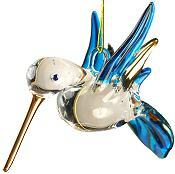 Mouth blown glass hummingbird ornament with gold string hanger.